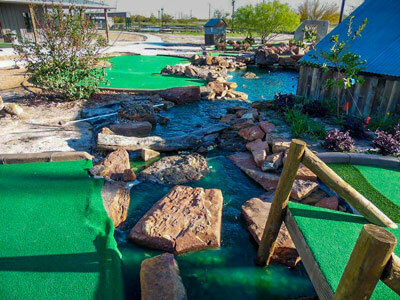 We call this our dream course. If you have the bigger budget, this is the course to build. We start with a big luxurious lagoon filled with fountains splashing water everywhere to get the attention of the roadside. We then add island shots crossing through the lagoon with fog misting up from everywhere inside the lagoon, we can even have frogs chirping if you like. We then have a retaining wall with a waterfall cascading over it. On each side of the waterfall, we add two more waterfalls that are about 10′ high and 8’wide. On the top elevation, we add a 20′ wide by 16′ high waterfall dumping its water into again another lagoon with a crooked dock bridge running through it. 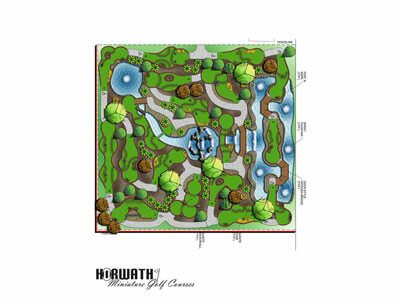 If that isn’t enough we add another waterfall on the back side running down to a large catch pond with more fountains. We are putting about 1800 gallons of water a minute over this front wall. 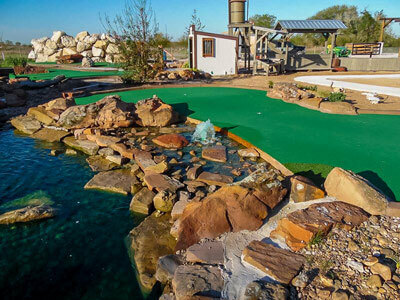 This miniature golf course gives you all the WOW factor you will ever need and still with a budget you can live with.